However, due to shrinkage, this will only be an estimate, with an error, varying with the concentration of the solute. The error is largest around 50 wt% concentration. Density of pure organic components: hydrocarbons, carboxylic acids and alcohols, sulphur compounds, nitrogen compounds and other common liquids. Shrinkage is that the resulting density is higher than calculated by Eq , and occurs when molecules with relativele large difference in size are mixed. Then, the smallest molecules are placed in voids between the larger molecules, and the density increases. The shrinkage will increase with an increasing difference in the molecule size of the solvent and solute. However, also effects other than size, as molecular shape and polarity, will influence on the shrinkage. 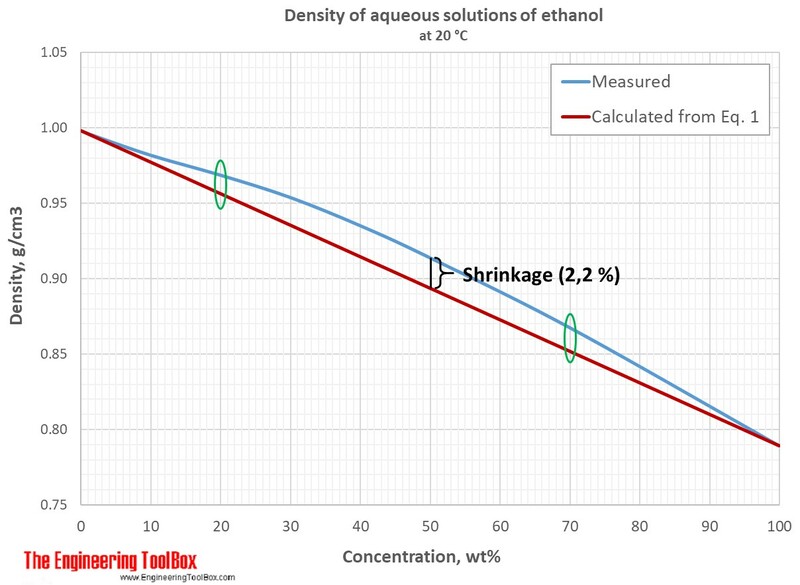 The same calculation is done for 50 and 70 wt% of ethanol, and the results and the difference from measured values are shown in the table below. In the figure below, it is seen that with ethanol concentrations < 20% and > 70%, the estimated values are closer to the measured values. 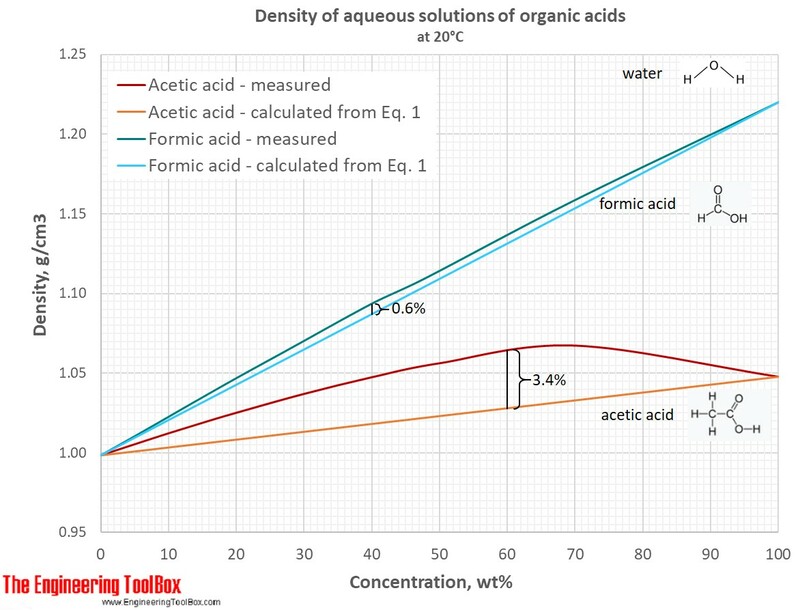 The figure below shows the shrinkage for aqueous solutions of formic and acetic acids. It illustrates that the shrinkage is largest when the difference in molecular size is largest. Engineering ToolBox, (2017). Shrinkage and estimation of density of a liquid-liquid solution. [online] Available at: https://www.engineeringtoolbox.com/shrinkage-estimate-calculate-density-gravity-solution-blend-mixture-d_1999.html [Accessed Day Mo. Year].